A Berwick mother of a disabled child has created an online one-stop shop for people in similar situations across the state. Michelle Jankovic said she was motivated to create the website after struggling to find sufficient resources to help her care for her son, Bailey, who was born eight weeks premature with cerebral palsy and a right hand deformity. Her daughter Jasmine, 5, was also born eight week’s premature but without any additional needs. “I spoke to a lot of carers who only new about half the services out there, so I would email them documents about support services,” she said. Ms Jankovic said the mission of the website, www.helpinghandishere.com.au, was to inform carers of support and services for their additional needs child, invite carers into her family’s experience and journey with their children and introduce carers to others in similar situations. It is made up of three sections. 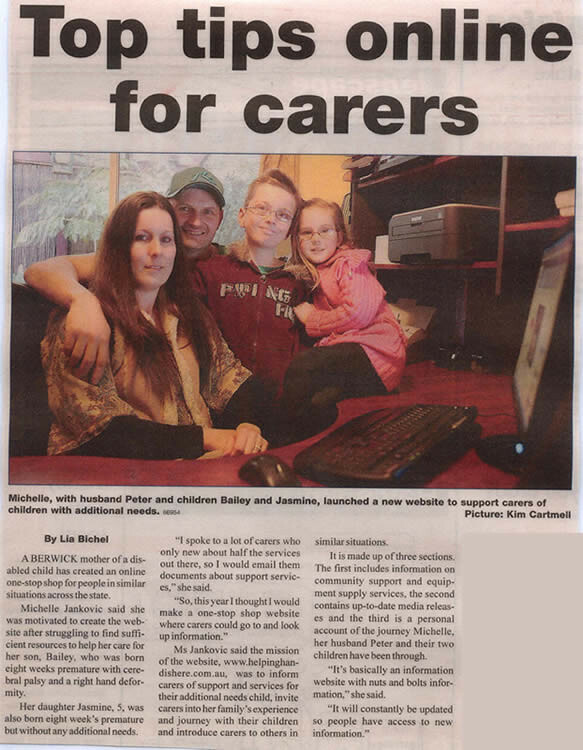 The first includes information on community support and equipment supply services, the second contains up-to-date media releases and the third is a personal account of the journey Michelle, and her husband Peter and their two children have been through. “It’s basically an information website with nuts and bolts information,” she said.